The Confederation of African Football (Caf) has revealed its preliminary lists of nominees for the 2018 African men’s and women’s Player of the Year awards. 34 names have been revealed for the men’s category, with eight of the nominees playing in the English Premier League. 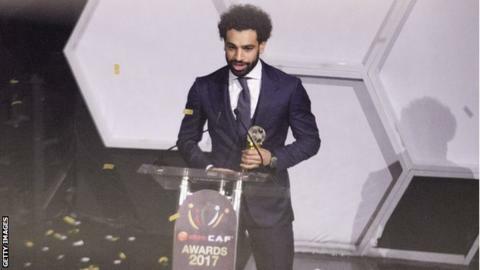 Last year’s winner, Egypt forward Mohamed Salah, is joined on the list by his two Liverpool team-mates Sadio Mane of Senegal and Guinea international Naby Keita. 12 men on the list play their football in Africa, including Youcef Belaili, Taha Khenissi and Anis Badri – who all play for the 2018 African Champions League winners Esperance in Tunisia. Caf previously had an Africa-based Player of the Year category which has now stopped. Morocco’s first appearance at a World Cup since 1998 is reflected on the list with five players nominated – more than from any other country. The other African nations to play at Russia 2018 – Egypt, Nigeria, Senegal and Tunisia – all have three players on the list, whilst Algeria – who failed to qualify for Russia – have four, including former Caf Player of the Year, Riyad Mahrez. Madagascar – who qualified for an Africa Cup of Nations for the first time in their history – are represented by Fanev Andriatsima who plays for Clermont Foot in France. Some of the names also appear on the Youth Player of the Year list including Cameroon’s Andre Onana and Morocco’s Mahmoud Benhalib. The Nations Cup qualifiers are also reflected on the 10-man list for Coach of the Year with Mauritania’s Corentin Martins nominated after he secured the country a place in the finals for the first time in their history. Morocco coach Herve Renard is also there alongside Nigeria coach Gernot Rohr and Senegal’s Aliou Cisse. Mauritania are also on the list for Men’s National Team of the Year – alongside Madagascar, Guinea-Bissau, Kenya, Uganda and Zimbabwe – reflecting a poor World Cup for African teams. In the women’s player category, this year’s Women’s Africa Cup of Nations – currently underway in Ghana – is well represented. Nigeria and Cameroon both have four players on the list of 15 – with Asisat Oshoala amongst the Super Falcons contingent and Gaelle Enganamouit part of Cameroon’s quartet. The coaches from all four Women’s Nations Cup semi-finalists – Nigeria, South Africa, Cameroon and Mali – plus Zambia, have been nominated for the Women’s Coach of the Year award.